The key word in this recipe is With. Resist any temptation to make it in your coffee maker. This will help explain why almost all cooking directions for oatmeal are misleading. It will also help eliminate 72.3% of expletives heard around breakfast time. After dull and boring, the number one problem with oatmeal is cooking it. That problem is characterized by boil over followed by cleanup. Somewhat obviously, it won’t boil over if it doesn’t boil. Here’s a demonstration of that principle. And unlike most high school experiments, this one actually works. Place the oats in a suitable bowl (see notes below). Place the bowl on the warming surface of the coffee maker. 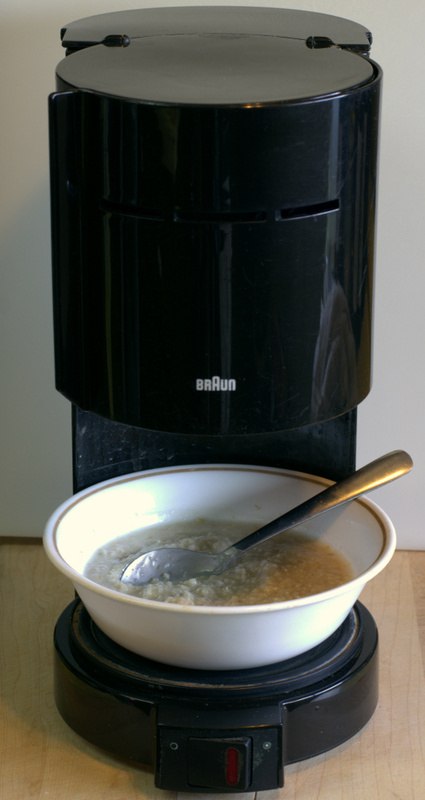 Add the water to the water reservoir of the coffee maker. Turn the coffee maker on. After the heated water has transferred from the reservoir to the bowl give the oats a good stirring. Set a timer for 7 minutes (see notes below) leaving the coffee maker on. Optionally an intermediate stir or two doesn’t hurt. After 7 minutes turn the coffee maker off. Give the oats a good stir breaking up any small lumps that may form in the bowl. The amount of water, oats and cooking time were taken off the oat package. The old (vintage?) Corelle bowl pictured proved to be an ideal choice. This is basically tempered glass and was able to stand up to the low heat from the bottom warmer. It fit in the coffee maker. Being somewhat wide, it spread out the oats and water so that more of the oats were in direct contact with the water. As the bowl is thin, it did not absorb much heat from the water. A large heavy ceramic coffee mug also worked. The cooking time had to be increased to around 9 minutes and the intermediate stirring was less optional. The mug sucked up more heat from the water, extending the cooking time. Avoid bowls (e.g., some plastics) that may be damaged by the warmer or leach unwanted elements into the oats. This method also worked using traditional steel cut oats which require around a 30 minute cook time. However for these, the water can be reduced from the package directions to around the same 3/4 cup listed here. With no boiling, there is much less loss of water during cooking. Traditional flat (not steel cut) oats weren’t tried. However this method should work for them also, probably needing less water than the package directions. Lessons learned here can also be transferred to stove top and microwave cooking. Keep the heat low to just under a simmer and avoid any boil over. This entry was posted on 06/19/2016 at 09:15 and is filed under cooking and related items, food, Recipes, Recipes, food, cooking and related items. You can follow any responses to this entry through the RSS 2.0 feed. You can leave a response, or trackback from your own site.